A series of 8 39mm denominations from .25 to 5000 available with 7/8inch inlays on the Amold and 2 44mm denominations. 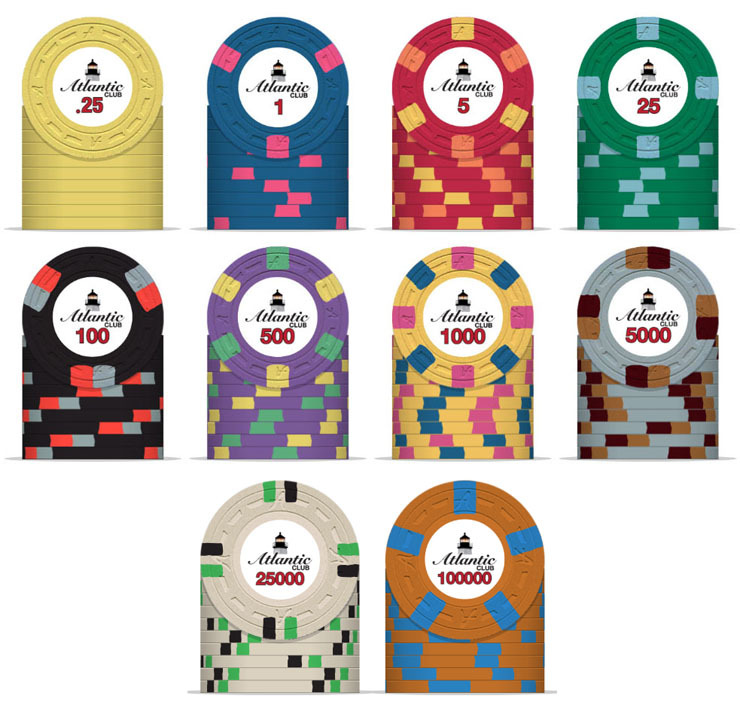 Sold as fixed sets of 300 or 500 in the colors shown for 39mm chips. 44mm chips will be $3 each plus shipping with minimum order qty of 10. Inventory of these is available for immediate shipping. Alternative quantities can be ordered at our regular retail prices and alternative colors can be made as regular custom orders subject to our normal terms and conditions. Contact us for alternative orders. Please note that shipping is only included for US addresses for anything other than sample orders. International will be extra - email for quote. Set of 300 low denominations (as pictured). Contains 1 x 50, 5 x 100, 25 x 100, 100 x 50. Price $540 shipped. Set of 300 high denominations (as pictured). Contains 100 x 50, 500 x 150, 1000 x 60, 5000 x 40. Price $625 shipped. Set of 500 low denominations (as pictured). Contains 1 x 60, 5 x 150, 25 x 150, 100 x 100, 500 x 40. Price $895 shipped. Set of 500 high denominations (as pictured). Contains 25 x 60, 100 x 150, 500 x 150, 1000 x 100, 5000 x 40. Price $1015 shipped. Sample set of 8 chips (one each as shown). Price $19 shipped. Single .25 sample. Price $5.50 shipped. Sample pair of 44mm chips (25k & 100k). Price $11 shipped.